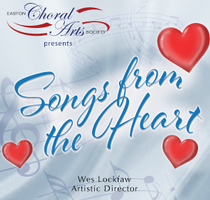 Songs from the Heart, which will include the 21st century choral piece, “For A Breath of Ecstasy” by Michael John Trotta, as well as an array of popular love songs. “For A Breath of Ecstasy” is a seven-movement work for chorus, strings, and oboe that is based on poetry by Pulitzer Prize-winning American poet Sara Teasdale. Accompanied by piano, oboe and strings, Trotta's music represents, in his words, "moments of yearning, love, joy and peace in the contemplation of love and nature." Fueled by a passion to share new music that engages conductors, ensembles, and audiences alike, Michael John Trotta (b.1978) is fast becoming one of the most “exciting and prominent new composers of choral music.” To complete the program, Easton Choral Arts Society will sing beautiful and clever arrangements of songs about the different aspects of love. Come hear music from Broadway musicals, movies, jazz and popular music, such as “Till There Was You” from The Music Man, Can’t help Falling in Love, Leroy Anderson's “Blue Tango” and more.